H.M.N. Hollis and by descent until 1985. Vivian Noakes, Edward Lear 1812-1888, 1985, illustrated p. 49. Susan Hyman, Edward Lear in the Levant, 1988, illustrated p. 44. Sheffield, Graves Art Gallery, Edward Lear, 1964, catalogue untraced. London, Royal Academy, Edward Lear 1812-1888, 1985, no. 20b, reproduced p. 49. 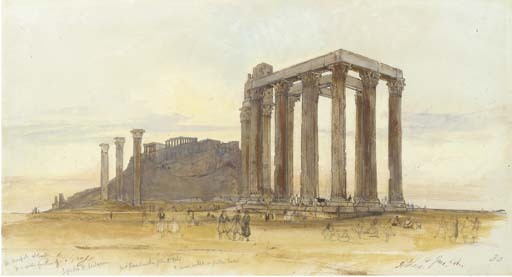 Whilst in Athens he met another friend whom he had known in Italy and to whom he presumably gave this drawing, Charles Church. Church's Uncle, Sir Richard Church commanded the Greek forces in the War of Independence against Turkey. Church spoke modern Greek and could act as Lear's interpreter. The ambassadorial party continued and Lear followed them by boat to Constantinople.